Lopi wood stoves are produced by Travis Industries, North Americas largest privately owned company producing wood and pellet stoves, gas stoves and fireplace inserts. 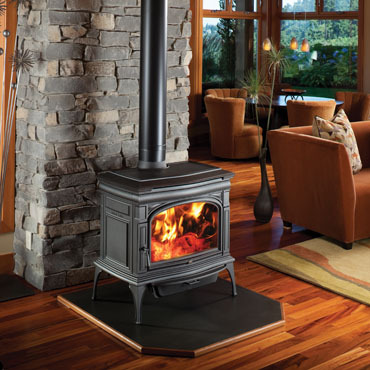 Based out of Mukilteo, Washington and founded more than 30 years ago, the company is known for creating exceptional wood stoves using high quality materials that have been proven to last for many years. If you're in the market for a new wood stove you'll soon realize there's a lot of different styles, options and manufactures to choose from. Due to the vast selection, it can seem overwhelming at times and picking the "perfect" stove seems impossible. One of the best ways to help narrow down your search is to start by researching stoves made by a reputable company who have a true passion for creating the best wood stoves possible, and Lopi is a great place to start. With nearly 1.5 million stoves installed by reputable dealers in the last 3 decades, Lopi prides themselves in always looking for ways to improve their stoves and the technology within their products. Although they are constantly working on new technology and designs, here are a couple of breakthroughs in wood stove technology that Travis Industries has created. The Hybrid-Fyre uses clean burning technology which produces an unbelievably clean burn with over 80 percent efficiency when used in their Cape Cod stove. The Greenstart Igniter System is unique to Lopi wood stoves and allows you to start a fire inside your wood stove without using matches or paper. The ignition system uses electricity to heat air to 1400 degrees ferinheight which can light kindling in about 1 minute from a cold start. The Greenstart System has a 15 minute run cycle and has literally made lighting a fire inside a wood stove as easy as a push of a button. Travis Industries produces many different Lopi wood stove models but the following are some of their most popular and recent additions worth considering in your home. The 1250 is a steel constructed, economically priced wood stove that creates a lot of heat for your home at an affordable cost. Ideal for small to medium sized homes, the 1250 can heat up to 1,200 square feet and can burn for up to 8 hours on a single load of firewood. The 1.6 cubic foot firebox has a maximum log length of 18 inches and the stove weighs 270 pounds. Unlike some of the larger and more expensive models, the 1250 does not come equipped with the rear damper that bypasses the heat recovery system. On the larger models, this rear damper when opened allows the smoke to travel straight up in the back of the stove which is great when lighting the stove because it prevents unwanted smoke from entering your home. The stove uses Lopi's unique convection chamber to move cooler air from the bottom of the stove through the backside of the stove where the air is warmed and expelled out the top. Overall for the price, this is a great little stove. Although the firebox is a little smaller than some of the other stoves which may require more frequent loading, it's a good valued stove. 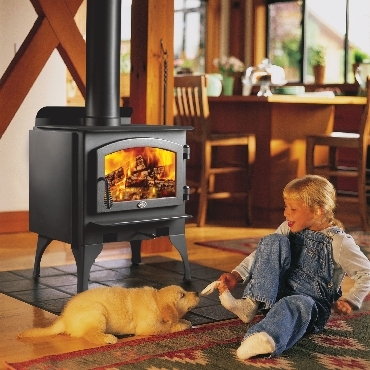 The 1750 is a steel constructed wood stove similar to the 1250 only larger. Made for medium to large homes the 1750 can heat up to 2,000 square feet and can burn up to 10 hours on a single load of firewood. Equipped with a 2.2 cubic foot ceramic brick lined firebox, it can handle logs up to 18 inches long and the stove weighs 430 pounds. The 1750 is a simple stove that's designed to give you heat without all the glamor to help make the stove more affordable. Like the 1250, it also uses a convection chamber to circulate warm air around the stove and into your home and it can be equipped with an optional blower motor. For the price, the 1750 is also a great stove if you're looking to heat a medium sized area. For larger homes, you may want to consider a larger stove than the 1750. Since 1984 the Endeavor has been Lopi's best selling wood stove. Equipped with a rear bypass damper to reduce smoke coming out of the front doors during startups, the Endeavor is perfect for medium to large sized homes. With a rear clearance of 4 1/4'' to combustible surfaces, it's one of the closest clearances in the industry meaning you can install the stove closer to a rear surface and save space. The stove can heat 1,200 to 2,000 square feet and the 2.2 cubic foot firebox can handle logs up to 18 inches in length and burn up to 10 hours between loads. This steel constructed stove weighs 448 pounds and would be a great edition to any home looking to save money by heating with firewood. 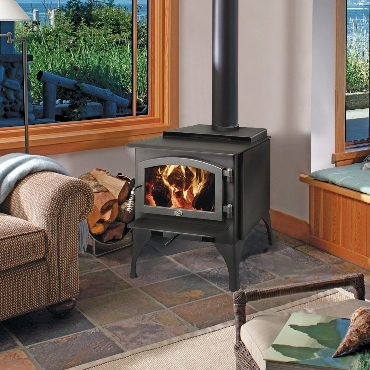 The Liberty is a large wood stove made for large homes. Capable of heating up to 2,500 square feet, the Liberty has a 3.1 cubic foot firebox that can handle logs up to 24 inches in length. Weighing 470 pounds and constructed from 5/16'' and 3/16'' steel plating, this is a large stove that's sure to keep you warm all winter long while reducing the amount of time you spend adding firewood to the stove. Like many of the Lopi stoves, the liberty has an exceptionally strong, heavy weight door with a large open viewing area that allows you to enjoy the views of a beautiful fire. It's convection chamber design warms the surrounding air as it circulates it around the stove, plus you can add the optional rear blower fan for even more heat circulation. The Liberty also has the option for the GreenStart ignition system that uses hot air to start the fire without the use of matches. 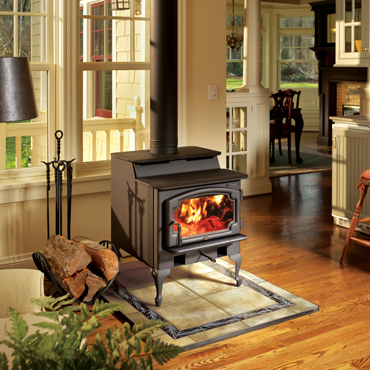 If you have a large home and are looking for a stove that puts out a lot of heat, the Liberty is a great choice. Unlike many other Lopi wood stoves that are constructed from steel, the Cape Cod is made out of cast iron and it's one of the cleanest burning and most efficient wood burning stoves on the market today. The stove uses Travis Industries new Hybrid-Fyre technology making the stove very efficient and clean burning. In fact, the Cape Cod burns at 80 percent efficiency and only produces 0.45 grams of emissions per hour. 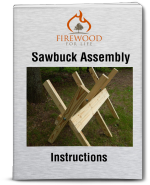 Its large 3.0 cubic foot fire box can handle logs up to 24 inches in length and the stove can heat homes up to 2,500 square feet. Like many of the other models in the Lopi collection, the Cape Cod uses a convection heat exchanger to pull cool air through the stove where it's warmed and circulated into the room. You can also add the optional rear fan for even more air moment into your home. The Cape Cod is a beautiful stove. It's large front door glass allows you to enjoy the views from a burning fire and its cast iron construction is a thing of beauty. 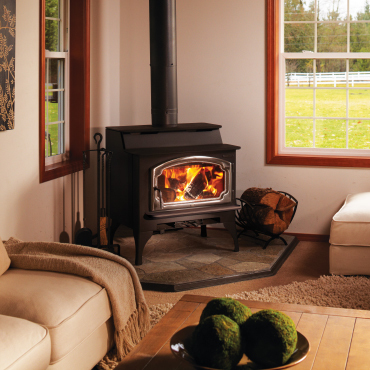 Winning many awards, the Cape Cod would be a welcome addition to any large home looking to heat with firewood. With so many different size and style options, you're sure to find a Lopi wood stove that's perfect for your home....no matter how big or small. With state of the art technology and a history of satisfied customers, Travis Industries have produced a great wood burning stove that's sure to keep you warm and happy for many years to come.